The fastest way to climb a tree is not with steps, a step stick or even a climbing tree stand. The fastest, easiest way to climb a tree is with Sport Climbers. Sport Climbers are sturdy, yet weigh less than 3lbs.! They attach to your hunting or pack boots (with two straps) in seconds. The ankle strap runs through a special two-ply foam pad that is soft on the inside (to cushion your ankle) and sturdy on the outside (to resist abrasion). Climb trees like a lumberjack! You've seen professional lumberjacks climb trees with amazing ease and agility using tree climbing spikes. 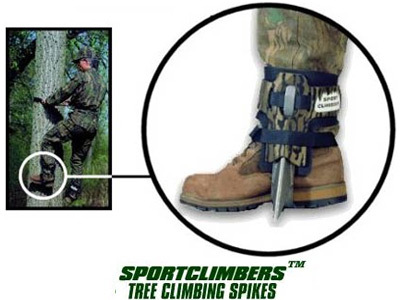 Now you can too with Sport Climbers, the tree climbing spikes designed for hunters. Lightweight and comfortable—attach in seconds! We've taken the tree climbing spikes used by lumberjacks and modified them, making them lighter, more comfortable and easier to use.